If you ever fantasized about golfing next to blue Caribbean waters and feeling the warm sweet breeze in your face, it is not hard to find. Your biggest problem is to figure out where to play and stay. 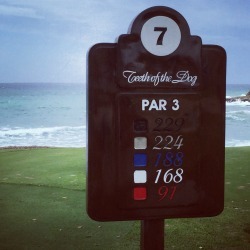 There are so many options in the Caribbean to golf on world class courses, and here are 3 luxurious spots which have all at least one outstanding challenging course and first-class accommodations. Operated by the Four Seasons, the Ocean Club is in Nassau; it is beautifully located on an amazing stretch of beach with an infinity pool looking over it. We received a beautiful welcome from many of the staff as we entered the main building as check-in was quick and easy. 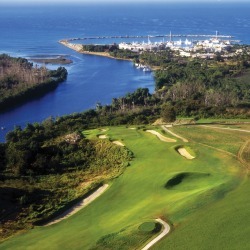 It is easily one of the best luxury golf resorts in the Bahamas. The rooms are beautifully designed, while our ocean front room opened to a patio with sweeping views of the ocean. The bed was comfortable, and the service (in-room butler) always made us feel extra special. Even at the beach which has clean white sand and clear bright blue water, the service goes above and beyond. You will enjoy eating at the Dune, everything on the menu created by Michelin starred chef Jean-George Vongerichten will leave your mouth watering. Our table was on the patio outside which was also incredible. Great food with outstanding views and the cocktails were delicious too. The nightly champagne and strawberries awaited us in the room, which was something we loved after our walks through the gardens, something everyone must do. When it is time to tee it up, you have to go play the Ocean Club Golf Course, it is not far from the resort and can be easily arranged to get you there. Designed by Tom Weiskopf, for the last couple of years, it has been home to the Pure Silk Bahamas LPGA Classic tour event. It is well maintained. While the fairways are wide and open, don't let that fool you because the course is still very challenging with plenty of fairway bunkers to avoid. It may also be hard to concentrate on the par 4 17th hole. 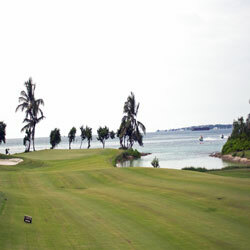 While it may be the shortest Par 4 on the course, it plays entirely on along the ocean and beach. From the back tees, it is 306 yards which often is played into the wind. The green is large, but you have to navigate shots around the bunkers that protect it. It's been said that it's better in the Bahamas, I would add especially at the Ocean Club. This is a 7,000-acre property, which has everything for any luxury golf resort getaway, tennis courts, 3 championship golf courses, water sports, beautiful beaches, and great restaurants. From the moment you arrive, you will be blown away by how beautiful the grounds are, incredibly peaceful and beautifully maintained. To get to Casa de Campo, you can either fly to Punta Cana which is about 47 minutes away or, depending on the time of the year, fly directly to La Romana and be at the resort in just 7 minutes. What is great about this luxury golf resort is that you have the choice of a hotel as an option. Rooms are fitted out to a high standard and have lovely views. The maids are exceptional, and the turn down service is such a pleasure to have. As one of the top luxury golf resorts, ask for a room that overlooks one of the golf courses so you can watch a variety of golfers in the late afternoon with your favourite cold beverage. The food is first class throughout the resort via a variety of restaurants. 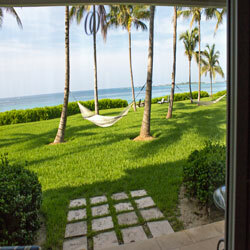 My favourite way to indulge at Casa de Campo is a villa vacation. Depending on your budget, it may not make sense if there is just two of you but with another couple or a group of girls, a villa takes your vacation experience to another level. Daily housekeeping service that includes a cook to prepare meals is a bonus. Each villa has its own golf cart assigned with GPS of the surrounding area. The GPS menu points you to activities, dining and shopping areas. With a villa, you now have more control of your holiday, and more freedom to do what you want when you want. Think of it as your home away from home with options in a tropical setting. For golfers, as one of the outstanding luxury golf resorts, Casa de Campo’s each course has its own challenges for players of all levels. All designed by legendary golf architect Pete Dye. The Dye Fore which has 27 holes of jaw dropping scenery of the Caribbean Sea with amazing views. Because of its higher elevation, the course has you playing over ravines. Be sure to have your camera because you will be playing along Altos de Chavón a replica of a 16th-‐century Mediterranean village, and the Dominican mountains, which challenge players with 40 mile-‐per-‐hour gusting winds. The Links course has been compared to the traditional Scottish and British courses because of its tight firm fairways and open putting surfaces that make you want to play shots along the ground. There are a few hills and numerous bunkers, but most of the holes dogleg either right or left-over undulating landscape. You'll play five holes that are directly surrounded by water for an extra challenge. 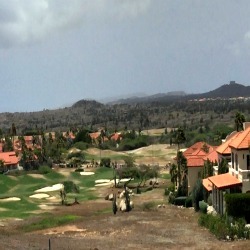 Aruba may not be known as a golf destination, but it comes close to being a perfect luxury golf resort getaway paradise. It all starts with a stay at the Tierra del Sol; there you can stay in a villa or an apartment. 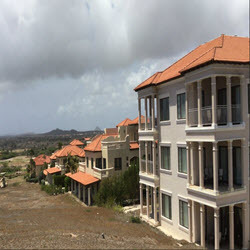 The apartments are very spacious balconies on either overlooking the golf course and the ocean. The bedrooms are decorated with nice furnishings and a large en suite bathroom. Everything you need and more is in the apartment fully equipped kitchen, air conditioning, daily light housekeeping, and even a wine fridge. Excellent meals can be enjoyed at the resort or venture down to the Palm Beach district. The resort has a magnificent club house and pool, fully equipped gym, free sauna, great restaurants with sweeping views of the beautiful north coast of Aruba. 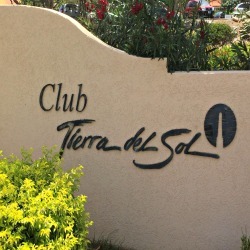 The Tierra del Sol golf course has two distinct layouts which make your golfing experience a fun and challenging outing. Its front 9 plays along on the ocean with great views and the back 9 consists of a desert layout. What you have to be prepared to cope with is the extremely windy conditions. The easy shorter holes play into the wind, while longer holes play down wind. With any of these 3 Caribbean luxury golf resorts on your list, be assured of an exceptional golf vacation with both golf and non-golf amenities to ensure a memorable experience. Whether you are a weekend warrior or a scratch player, any of the 3 are definitely a perfect fit for you. Put them on your list today! One of Aruba's most luxurious spots to stay to unwind. A choice of apartment or villa. The golf course is right outside your door.